If you are looking for the best beach canopy, we can help. We have reviewed the top six products on the market, braved the sweltering summer heat, blustering winds, and struggle with the shade bowls all to test the different canopies mentioned in both prime and peaceful temperatures all the way through the blustery evening temperatures. Which beach canopy is the best one out there? Well, that’s really depends on how long you need the canopy, what you will be doing, how far and will be walking before you set it up, how many people will be with you, and how the weather conditions are where you choose to set it up. You need to be cognizant of all of these factors before you find the beach canopy best suited for your needs. Understand that there are different types of Beach canopies. Mini EZ-Up styles have the simplest design and dome style are your main options. The first one is a smaller version that resembles a dome and doesn’t have any side panels for a floor. The second one is designed to have more height at the edges and the upper corners. Obviously the dome style has more of a dome-shaped to it where the roof is concerned. There are different reasons for selecting different shapes and we will go over that. When you assess different beach canopies to find the best beach canopy for you, there are things you want to consider. Consider the livability. The livability refers to how much usable space there is, how much shade you get, the height provided once it is set up, and features like having a removable side wall. For this, the Paha Que Cottonwood LT is considered the “best” because of the amount of square footage it has, enough to fit a group of 6 to 8 people. Generally speaking, dome styles are the best for livability because even if they haven’t told roof, the edges fall down along the legs so, depending on the depth of the sandy beach on which you place it, you might be giving up a foot or two of height. The next thing you want to evaluate is the set up. You simply want to figure out how easy it is to set up your canopy and take it down. The worst thing is to finally make it to a child soccer game, a campground, or whatever other vacation warrants the setup of your beach canopy only to spend 90 minutes trying to set it up. If you’re only going to be someplace for 30 minutes, you want something that can be set up quickly so you don’t waste any time. For this, the Lightspeed Quick Canopy was obviously the best, given its name. You can hold 2 to 4 people underneath and it takes less than three minutes to completely unpack and set up. That includes every aspect of the setup. Literally every three minutes everyone can just step underneath and enjoy. Obviously if you’re going to be outside, especially at the beach, there will be wind. You want to pick the best beach canopy in part based on how well it withstands wind and maybe even light rain. Sure you probably don’t want it to be windy or rainy but there are plenty of situations where it could happen even if for a few minutes. You also want to be able to set up your beach canopy, go out onto the water, and come back to fund it in exactly the same condition as you left it, and not locked over on the sand. The REI alcove shelter was the best in terms of wind resistance. The reason for this is simple science. The dome style canopies allowed wind to pass through the more easily and water typically falls off the dome-shaped in a more fluid, no pun intended, fashion. You want to evaluate the best beach canopy based on durability as well. This means how durable the fabric is, how durable the pole construction is, and how durable the pole connection points are. If any one of those three is not in line with the others, it creates weak link in your chain. Not all the pole construction reviewed here is the same. The REI alcove though is certainly the best because it has the thickest holes. At 19 mm thick, each of the polls are powder coated steel and each of the connection points along the system equally distributes the flex stress across all of the six connection points. You certainly won’t have as much trouble with this canopy as you might others. Obviously if you are going to the beach, you probably have a bag full of beach towels, toys, snacks, sunscreen, chairs even, and probably a cooler or surfboard. When this happens the last thing you want is to lug around a heavy canopy with you. 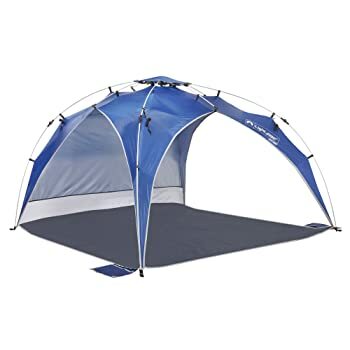 Most of the time you have to walk a bit to get to an actual beach, park, or a campsite so you want to beach canopy which is easy for you to transport. The Kelty Shade Maker 2 is the best option here. It is not the lightest product out of the six but it does have the cooling convenient backpack style carrying case. While the Amazon basics has the wheels, as mentioned later, that’ll be really hard for you to transport across anything other than a paved surface. This is especially troublesome if you are going across the dirt, mud, or sandwich to get stuck inside the wheels. Having the best beach canopy that you can simply throw onto your back just like a backpack makes it really easy no matter how heavy it is to bring it from your car down to wherever you want to set up. It also frees up your hands to carry out the rest of your beach based items. If you want the best beach canopy, this is it. It is incredibly easy to transport and easy to set up, even if it is windy you will have no problem. There is a side wall provided which not every canopy offers. In fact it was rare to find a beach canopy that had that. The sidewall is really great if you have wind coming in from one direction or a very distinct sunlight or even just want to privacy. The structure of it is great because of the tilted entry way. There is a lot of usable space and you can rules that sidewall anywhere on the three sides to best fit your needs. This gives you a lot of protection from the wind. Just make sure you don’t trip over the webbing on the frame. A basic design this is one of the only canopy tents that actually comes with four wheels on the carryback. Obviously if you are trying to set up on a beach which has paved paths these wheels can come in handy. If you are simply trying to drag it through the sand it might not be as useful. However, this design is really simple with this cathedral -like shape and the supporting legs are slightly tilted so that there’s extra space underneath. This design is made of high durability steel and offers UV protection. It is a bit heavy though which is why they furnished the bag with wheels. This REI design is really the best you’re going to get given the price you have to spend. If you’re looking for the Best Buy out there, this is it. It’s really easy to set up and it is incredibly solid once it is set up. The issue is that if you don’t set it up properly the top of it will start to collect rain puddles instead of letting them fall off either side. More importantly it is really heavy. This canopy is about half the price of most competing products but it has 100 ft.² of usable space and is incredibly comfortable. The design of it is exactly what you would expect from REI which means it is durable and well-constructed. If you want to shelter that you can enjoy for a long period of time or if you want to set up something right next to your vehicle, this is perfect. 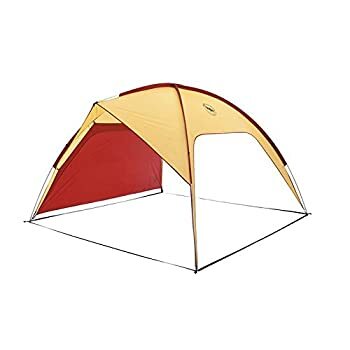 This canopy would be great for a weekend camp out on the beach for an overnight situation on the coast especially if you have five or more people who need to fit underneath it. This canopy was really tall, it is a bit expensive but it has a lot of livable space underneath. More importantly it is rather durable. Once everything is set up you can leave it on the beach for days and enjoy your time in the sun. The biggest downside is that it will take you quite a long time to set up. It is a relatively heavy design all things considered so it isn’t something you want to pack with you and hike a long way. If you’re trying to get to a secluded part of the beach where you have to traverse down the cliff side, this might not be the canopy pack. This design is the second to last option out of the six that you might consider for wind resistance because it is really challenging to set up if there is any wind. Most people don’t consider how windy a beach usually is especially if you are in the northern half of the East or West Coast. 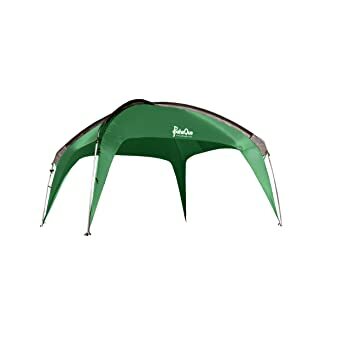 This canopy, however, does come with a great backpack so you can put everything inside the backpack and carry it down to wherever you are planning on having your barbecue or pitching your tent. 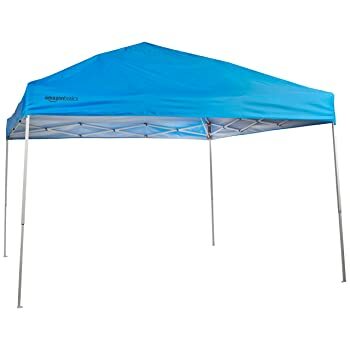 The canopy itself is very tall when it is set up which is something that most canopies don’t offer so people who are slightly taller or kids you want to run around won’t have to lean down. If you are on your own though, avoid this canopy because it is almost impossible for one person to set up on their own. It’s only going to work if you have a big party who can all lend a hand. This canopy is one of the cheapest on the markets. 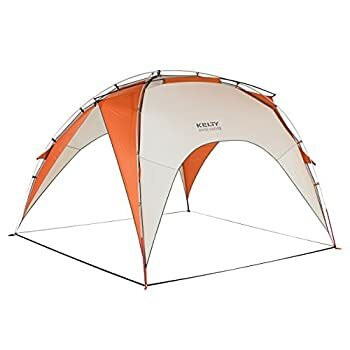 It is really lightweight so if you are camping somewhere or hiking to your beach location with a lot of other gear you won’t add a great deal to what you’re carrying. It is also really quick and simple to set up. Of course the downside here is that it isn’t very durable and when it’s inside the package, before you set it up it’s really bulky which can make it difficult to carry. While the design seems great it does catch the wind which makes it rather difficult in any situation where your beach might have a breeze. Overall, depending on the number of people who were trying to seek shelter beneath your beach canopy, how you use it, and how far you need to transport it, your needs will be different. That is why it is important to review the best beach canopy by looking over multiple options. This will help you to best find something that fits your beach based needs.